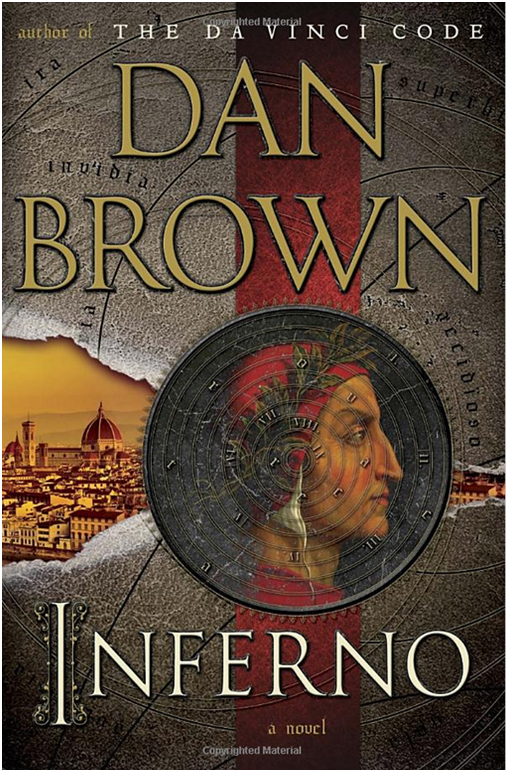 Dan Brown’s latest action thriller Inferno follows art historian Robert Langdon in a fast-paced roller-coaster hunt for the source of a genetic hack delivered to everyone on the planet via a highly contagious airborne virus. As in previous novels, Langdon works against the clock to decipher hints hidden in the treasures of the world’s art and literature, fighting intrigue and deception. I was mainly interested in Brown’s portrait of transhumanists and their scientific and philosophical ideas, which play a central role in the novel. There’s a number of recently published transhumanist-themed novels, such as The Transhumanist Wager, Nexus, and Human+. But this is Dan Brown, the writer who sold hundreds of millions of copies of previous “philosophical thrillers” The Da Vinci Code, Angels and Demons, and The Lost Symbol. It’s easy to predict that Inferno will be a bestseller, probably followed by a successful film, and the first introduction to transhumanism for millions of readers. This is an important moment in the history of transhumanism — but good or bad? The book opens with the suicide of famous genetic engineer Bertrand Zobrist, a scientific genius who jumps to his death from a historical building in Florence. A few days after, Robert Langdon wakes up in a hospital bed in Florence with a bullet wound and no memory of his last two days. A killer immediately breaks in the hospital to finish him, and Langdon escapes with the enigmatic doctor Sienna Brooks. He’s on the run, and everybody is looking for him with murderous intent, even the U.S. government. Or so it seems. As in previous novels, Langdon must unravel a mystery. 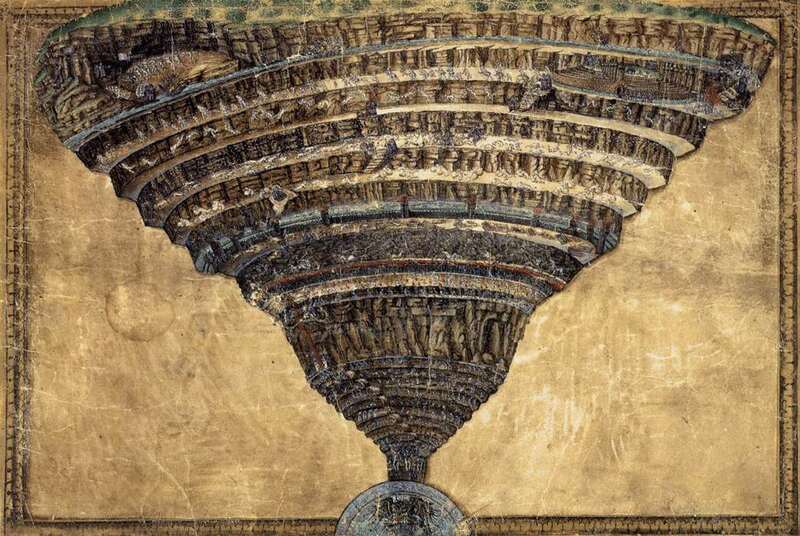 The only hint is a high-tech biohazard container, and inside, an optical device that projects the “Map of Hell” (a version of the famous Botticelli Abyss of Hell, inspired by Dante’s Divine Comedy). But it seems that this version of the painting was modified … and something momentous will happen the following day. Bertrand [Zobrist] had boundless hope for humankind. He was a transhumanist who believed we are living on the threshold of a glittering “posthuman” age — an era of true transformation. He had the mind of a futurist, eyes that could see down the road in ways few others could even imagine. He understood the astonishing powers of technology and believed that in the span of several generations, our species would become a different animal entirely — genetically enhanced to be healthier, smarter, stronger, even more compassionate [as we learn from one of the main characters later]. Except for one problem. He didn’t think we’d live long enough as a species to realize that possibility. Zobrist was a Dante fanatic. He was also obsessed with the global population explosion, and an ensuing Malthusian hell — caused by overpopulation. So was he a transhumanist mad scientist? He thought that the Black Death, which killed 30 to 60 percent of Europe’s population of Europe in the Middle Ages, was one of the best things that ever happened to Europe, because it reduced the population and created a surplus of food and wealth that opened the way to the Renaissance. So did Zobrist create a plague to curb the world’s population? Is Zobrist’s plague set to be released the following day? If so, where? 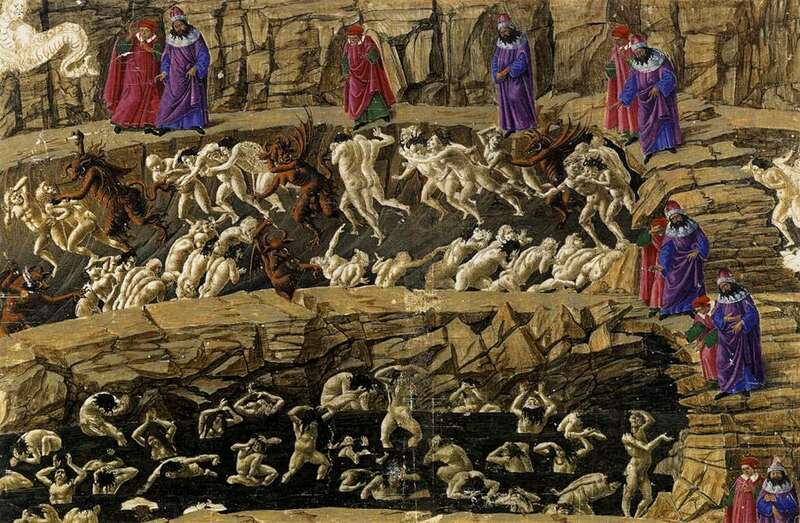 Langdon’s search is desperate, but Zobrist left many hermetic hints based on Dante’s Divine Comedy and later Italian Renaissance masterpieces, which lead Langdon first to Florence and then Venice and Istanbul. I suggest you read the book first, and then come back to read the rest of this review. Remember, in a Dan Brown thriller, things are never what they seem. Did Zobrist really create a plague to kill people or was he an eugenic idealist in the Julian Huxley model? Zobrist agreed, and wanted to curb the world’s population to healthy levels, but without killing people. * So instead of using a plague, he created an airborne virus that permanently modifies the DNA in human cells, but without killing the cell. Nobody gets sick, but the virus makes one person in three infertile — the “optimal” ratio calculated by Zobrist. “[Zobrist] created something known as a “viral vector,” explains Brooks, the doctor who helps Langdon evade his killers at the beginning — a former child prodigy with an off-the-charts IQ and a committed transhumanist. “It’s a virus intentionally designed to install genetic information into the cell it’s attacking,” she says. A vector virus … rather than killing its host cell … inserts a piece of predetermined DNA into that cell, essentially modifying the cell’s genome. It turns out that Zobrist’s released his virus a week before the events. And the momentous event announced by Zobrist’s hermetic hints was not the release of the virus, but its global saturation date. Airborne and extremely contagious, the virus has already infected the entire population of the planet and genetically modified everyone. There is no return. At the end of the book, WHO Director Elizabeth Sinskey realizes that “we’re on the verge of new technologies that we can’t yet even imagine,” with dangers, but also with hopes. “And new philosophies as well,” adds Sienna. “The Transhumanist movement is about to explode from the shadows into the mainstream. One of its fundamental tenets is that we as humans have a moral obligation to participate in our evolutionary process … to use our technologies to advance the species, to create better humans — healthier, stronger, with higher-functioning brains. Everything will soon be possible. Sienna and Sinskey plan to leave for WHO headquarters in Geneva to help manage the new world created by Zobrist. Humanity is now in possession of tools to modify itself, and things will never be the same. While I suspect some transhumanists may approve of covert global genetic modification for positive ends, I personally find the idea disturbing: it violates autonomy and self-ownership. Please don’t change my DNA without asking me, thank you very much. Others may find this even worse: a form of global bioterrorism.